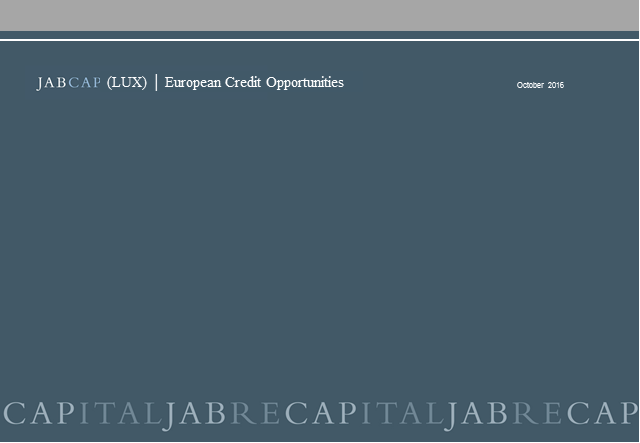 The purpose of this webinar is to present the newly launched JABCAP (LUX) - European Credit Opportunites and to talk about the credit market and the outlook for the next quarter. The purpose of this webinar is to review 2017 across all the strategies managed by Jabre Capital Partners and share our market and economic outlook for 2018. The purpose of this webinar is to review 1H 2017 and share our market and economic outlook. The purpose of this webinar is to present the JABCAP (LUX) - European Credit Opportunites Fund and to talk about the credit market as well as the portfolio strategy and positionning. The purpose of this webinar is to review 2017's first quarter and share our market and economic outlook. The purpose of this webinar is to present the JABCAP (LUX) - European Credit Opportunites and to talk about the credit market and the outlook for the next year. The purpose of this webinar is to review 2016's fourth quarter and to discuss what Philippe Jabre believes is a paradigm shift for Global Market activity following the Trump win and how it will benefit active fund management. Please join the JABCAP Emerging Markets portfolio manager, Carl Tohme, for a webinar on October 12th at 4pm (CET). Carl will provide a year to date update for developing markets and a brief outlook for the last quarter of 2016, as well as the portfolio strategy and positioning. The purpose of this webinar is to review 2016's second quarter and share our market and economic outlook. The purpose of this webinar is to review 2016's first quarter and share our market and economic outlook. Please join the JABCAP Emerging Markets portfolio manager, Carl Tohme, for a conference call on Jan 26th at 4pm (CET). Carl will be discussing prospects for developing markets in 2016, as well as the portfolio strategy and positioning.